In the beginning, Abi wanted to be a doctor, but her science teachers encouraged her to study science, including her high school AP Biology teacher, Mr. Wanie. He was “seriously amazing,” helping Abi to realize that she was good at science. In college, her research advisor, Dr. J. T. Ippoliti, motivated her to learn synthetic chemistry and inspired her to pursue chemistry instead of medicine. Now, she is “inspired by great women scientists like Alanna Schepartz, Carolyn Bertozzi, Sarah Reisman, Jennifer Doudna and Frances Arnold”. These women are certainly inspirational, as Frances Arnold won the Nobel Prize in Chemistry in 2018. “It’s never too late to change your mind! If you’re interested in science now but aren’t sure whether you’re more interested in physics or engineering or chemistry or medicine or biology, pursue them all and you’ll find your niche! If you have any questions for Abi, other members of the Open Labs team, or if you want more information on how to attend or get involved with upcoming events, contact us at openlabsfellowship@gmail.com. Also, be sure to follow us on Facebook, Twitter, and Instagram for the latest Open Labs and science updates! Sharif Kronemer is a fourth year Ph.D. student in the Neuroscience Department at Yale University, as well as the Director of the Yale University branch of Open Labs. Sharif’s interest in science began in a high school philosophy class that focused on philosophy of mind. He recounts, “Philosophers of mind were really neuroscientists and psychologists before either formally existed as a field of study. These philosophers were trying to better understand how the mind worked and its relationship to the brain. I was fascinated by the questions these philosophers asked but I wanted to use a scientific approach towards answering these questions. This inspired me to pursue the study of consciousness in the framework neuroscience.” On that note, Sharif strives to identify key brain networks necessary for consciousness (Sharif explains consciousness or perception as “the state of being able to notice and potentially report on something [e.g., noticing a car driving by, or the feeling of pain or happiness]”). Both philosophers and scientists have been studying consciousness for hundreds of years. Sharif gets to actually work with community members who volunteer to participate in his studies. Participants complete computer tasks involving perception while Sharif records brain signals using various technologies such as fMRI and EEG. Results from his studies will clarify where and how consciousness works in the brain. Potential applications of these conclusions could be used to restore consciousness in patients (e.g., coma) or create an artificial consciousness. He had his first laboratory learning experience at the age of 19. He was bold and determined, emailing various researchers with whom he did not have any connections to find a summer placement. An investigator at Georgetown University offered him a position in the lab, where Sharif learned about antiepileptic drug effects on the developing brain. As the only research assistant in the lab that summer, he worked in the wet lab preparing chemicals and stains and was able to interact individually with Ph.D. students and postdocs. While this experience helped him understand that he did not want to work in a wet lab, he still learned valuable lessons about the scientific process. Every adventure will teach you something about yourself. As he is becoming more senior in his Ph.D. research, Sharif finds balancing his lab obligations with my passion for science outreach has become more challenging, but is still able to find time for both, “This requires setting aside most of my evenings for outreach, but because I love engaging in outreach, it rarely feels like work”. Attesting to his passion for outreach, Sharif is also a Graduate Affiliate at Pierson College at Yale and helps to organize events and mentor Yale undergrads on their research projects. If you have any questions for Sharif, other members of the Open Labs team, or if you want more information on how to attend or get involved with upcoming events, contact us at openlabsfellowship@gmail.com. Also, be sure to follow us on Facebook, Twitter, and Instagram for the latest Open Labs and science updates! For Chantanelle “Chani” Nava, her appreciation for the scientific method really “took off” in eighth grade. She had entered into a bottle-rocket building competition that awarded a prize to the bottle that flew the highest. The only materials allowed were a 2-liter plastic bottle and a sheet of cardboard paper. With no previous experience, Chani spent the building time trying out wings with different shapes and sizes, placing them in different positions on the bottle. She then tested how high each bottle flew when she threw it, and adjusted her tests based on which design did best. Her accidental but effective use of the scientific method launched her all the way to first place! These days, Chani continues to use the scientific method as a second-year graduate student with Harvard’s Astronomy Department. 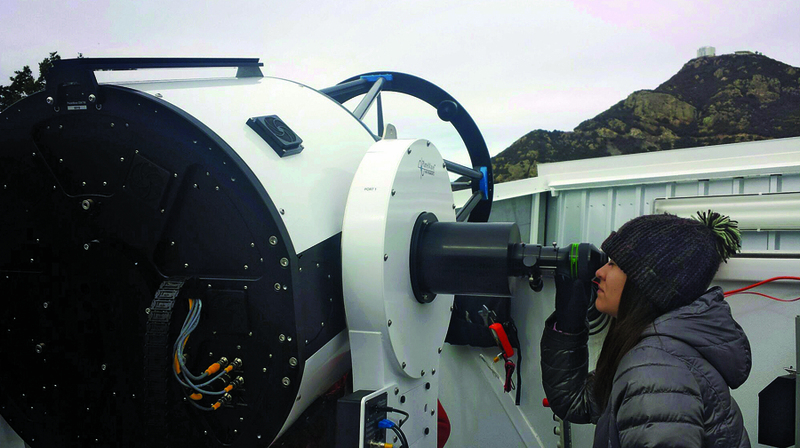 Though she originally intended to become a medical doctor, she stumbled onto her passion for astronomy after taking a physics class her second year in college. With strong mentorship from her lab instructor, Jaylene Naylor, and later research mentor, Professor Nate McCrady, Chani was able to navigate through challenging coursework and personal doubts to become the strong researcher she is today. Now, Chani works to detect planets orbiting stars other than our Sun, or exoplanets, with the Doppler shift method. As planets travel along their orbits, they cause their host star to wobble slightly around the common center of mass of the planet and the star. We are able to observe this wobble as a periodic red and blue shift in the color of the star’s light. Sometimes, this shift becomes hard to find due to activity on the star’s surface that causes similar color shifts. Chani’s research focuses on better characterizing this activity on the star’s surface so that astronomers everywhere can detect planets more confidently using this method. When not finding other planets, Chani enjoys exploring this planet! She likes to spend weekends mountain biking, kayaking, or even snowshoeing through the wilds along with her boyfriend, Russell. She also enjoys embarking on adventures in Boston, where she lives, exploring the local landmarks and museums. Things can get hectic as a graduate student, and so Chani makes sure to take the time to cook full meals and play with her pet cat Kiki every day. For Chani, it is important to evaluate and reevaluate your goals often. Your future self may end up very different from what you imagine now. As you go through big decisions in life, it is always important to take a step back, take stock of how your feelings, and take risks. “When you are feeling unsettled about where your future is heading, turn off your autopilot mode to address those unsettling feelings, even if it is intimidating to veer from a course for which you have already laid much groundwork.” Taken from a Montana girl who was once enroute to becoming a doctor and is now a successful astronomer, your life could lead you anywhere, so make sure you catch all the turns in the road! If you have any questions for Chani, other members of the Open Labs team, or if you want more information on how to attend or get involved with upcoming events, contact us at openlabsfellowship@gmail.com. Also, be sure to follow us on Facebook, Twitter, and Instagram for the latest Open Labs and science updates! Shannon Leslie, a third-year graduate student in Yale University’s Interdepartmental Neurobiology program, loves being a scientist because it provides her with the opportunity to ask important questions that interest her, then go out and find the answers. She was inspired to enter the field of science by an amazing teacher who showed her the fun and power of science during her freshman year of high school. Fascinated, Shannon reached out to a scientist from a local university, who helped her to organize her first lab experience during that summer. While working in the lab, Shannon learned what research really was and how it was conducted with the help of graduate students and postdocs in the lab. She was also particularly inspired by how much the researchers around her loved their jobs. She knew from that point that she wanted to go to graduate school and continue with research throughout her studies. As a graduate student, Shannon has become involved with research focusing on a region of the brain called the prefrontal cortex. The prefrontal cortex is responsible for many unique functions such as attention and short-term memory, but it is also particularly vulnerable to diseases such as Alzheimer’s disease and schizophrenia. Shannon studies the molecules that underlie the unique abilities and vulnerabilities of the prefrontal cortex. By studying these molecules in the context of age and stress, she is advancing our knowledge of their relationship with psychiatric illness. Outside of research, Shannon loves being in the outdoors, hiking, running, and spending time with her recently adopted dog. For Shannon, outreach is extremely important because it reminds her why she loves science in the first place. To students interested in science, she recommends always asking questions and being unafraid to reach out – scientists are extremely welcoming and happy to talk about their research! Thanks to Shannon for all of her hard work and contributions to Open Labs! If you have any questions for Shannon or for Open Labs, please feel welcome to email us at openlabsfellowship@gmail.com or leave a comment below! Holly Merta discovered her passion for advancing scientific knowledge and answering questions no one has answered before while in undergrad at the University of St. Thomas in Houston. It wasn’t until she started conducting exciting research on small worms called Caenorhabditis elegans in Dr. Alex Simmons’ lab that she decided to pursue a career in science, although she was initially planning on becoming a medical doctor. As a graduate student at Yale University, Holly continues to push scientific boundaries in her investigation of nuclear envelope reformation. Similar to how a cell is surrounded by a membrane that separates it from the outside environment, nucleus is also surrounded by a membrane called the nuclear envelope that separates the important genetic material housed in the nucleus from the rest of the cell’s components. As a cell divides, the nuclear envelope has to break apart so the DNA can be divided between the two new cells. The nuclear envelope then has to reform once cell division is complete. However, the process of how the nuclear envelope reforms after cell division is not completely understood. This is an important question to answer so we can better understand diseases in which cell division is abnormal, like cancer. Holly is interested in investigating the timing of nuclear envelope reformation and the players involved. One of Holly’s favorite parts about being a scientist is the flexible and self-directed lifestyle. She says she enjoys that she can choose what she wants to study and she can set her own schedule. Additionally, Holly loves talking to the scientists that she works with who, like her, are very curious and invested about what they are working on. When not doing bench science, Holly really enjoys music, singing, playing the piano, and writing music. She takes the skills she develops when writing music and uses them to help her to write her scientific papers so they also flow and are interesting. Together, Holly’s experiences have driven her desire to become a teaching professor at a university. Her high school teachers at Lamar Consolidated High School and her professors at the University of St. Thomas were passionate about helping their students achieve their career goals and to develop their skills to contribute to society, which is exactly what Holly wants to do! She recommends that even if you may not know what you want to do as a career at first, to pick a path, stick with it, work hard, and do your best in that path. If you want to switch paths then you will have developed a strong work ethic and many skills that can be used in a variety of fields. Thanks to Holly for all of her great work with Open Labs and for giving us an insight into her pathway to science! If you have any questions for Holly or want to learn more about her work, please post a comment below or send us an email! In an interview with meQuanics (a podcast about physics from Japan), Open Labs' founder Zlatko Minev discusses physics and where to link up with science outreach and career development resources for graduate students, featuring the progress of the Open Labs model in the US. Congrats to Zlatko Minev- recipient of 2016 Yale-Jefferson Public Service Award!! Congratulations to our very own Zlatko Minev who received a 2016 Yale-Jefferson Public Service Award for his hard work in founding The Open Labs!! When asking a scientist what motivated them to pursue their career in science, it’s common to hear that the scientist always just enjoyed science and decided to focus their career goals in that direction. Matt Grobis, on the other hand, never considered pursuing science as a career until he had an eye-opening experience in his biology class during his junior year of high school in Vernon Hills, Illinois. Until this class, he wanted to be an author and particularly enjoyed his English classes, but he soon discovered he equally enjoyed learning about the natural world that surrounds us. 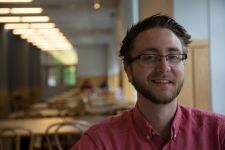 After beginning college at the University of Illinois at Urbana-Champaign as an English major, Matt soon transferred to integrative biology to continue studying how the natural world works while still pursuing his writing interests. Matt is a firm believer in not getting discouraged when things don’t go according to plan. While Illinois was not his top choice for college, he had an incredible experience and took advantage of the many opportunities there. Despite graduating college with uncertainty about the next steps, a sudden stroke of luck appeared two weeks later with a scholarship he’d been waiting on. Matt also applies this mentality to his current research. He explains that “data collection and experiments rarely work out the way you imagine. It all looks smooth from a distance, with one step logically leading to the next. But it’s often not!” As a graduate student at Princeton in the Ecology and Evolutionary Biology department, Matt studies the behavior of animal groups and, specifically, how schools of fish relay information through their group to avoid predators. Matt uses quantitative approaches such as computer programming to address his research questions in the Couzin lab. Matt loves research but he’s keeping future doors open. “If the past taught me anything, it’s that life doesn’t always go according to plan. I’d love to do research as a professor at a fancy university. But I’d also be really excited to work as a data scientist at a company, or to focus on delivering informative and interesting lectures as a professor at a small liberal arts college. We’ll see what happens.” In the meantime, one of Matt’s biggest priorities is communicating science in a way that is accessible to everyone. To that end, Matt maintains a blog called The Headbanging Behaviorist and is a co-founder and director of the Open Labs branch at Princeton. He is also a co-founder and the managing editor for Highwire Earth, a blog on sustainable development. Thanks to Matt for all his hard work with the Princeton branch of Open Labs and for sharing his story and advice with us! If you have any questions for Matt or about Open Labs in general, please send us an email at openlabsfellowship@gmail.com. Also be sure to follow us on Facebook and Twitter for more up to date information on events and news! Learn more about Molly Gale's research and what got her interested in becoming a scientist on this month's Open Labs Member Spotlight! 2016 Spring Science Cafe at Yale was a success! On Sunday, April 10th, Yale Open Labs hosted another successful Science Cafe event! Over 100 students and parents, along with dozens of graduate student volunteers, took time out of their busy schedules to listen to four fantastic science talks given by graduate students who perform cutting edge science at Yale. Our first speaker, Charles Brown, is a PhD student in Physics and gave an outstanding talk on quantum uncertainty. This talk was followed up with an exciting story presented by Pathology PhD student, Molly Gale, about a successful targeted cancer therapy used in the treatment of breast cancer. Our third speaker was Andrew Barentine who gave us an overview of very "cool" work he did involving use of super cold atoms. Finally, Michelle Hutchings, a PhD student in Chemistry, told us about the road to how scientists like her go about identifying the many potential uses of tiny microbes. Following the talks, students got to ask the speakers and other volunteer graduate students about science, their research, as well as college and careers. There were some great questions asked following the talks as well as at the small group discussions. The students, parents, and graduate students all learned a lot from each other and had a great time! Thank you to all of the students and parents who attended the Yale Science Cafe! Without you, this event wouldn't be possible! A special thank you to all of the speakers. graduate student volunteers, and Pathways to Science team for helping out and making this event such a success! We can't wait for future Science Cafes and Open Labs events! Want more information and up-to-date news? Follow us on Twitter at @YaleOpenLabs or on Facebook at www.facebook.com/TheOpenLabs/. Check out the Open Labs Introductory Video! Are you interested in learning more about Open Labs? Watch our introductory video about Open Labs and to get an idea about why we love science! We can't wait to share this passion with you! If you want to get more involved, explore our website to get more information on upcoming events like Science Cafe or laboratory tours or to get more in depth information about a topic you might have heard about at an event. We look forward to seeing you at upcoming events and hope you enjoy your journey in science! Jordyn making it happen at Open Labs @ Penn Science Cafe. If you're in a bad mood, go for a walk. If you're still in a bad mood when you come back, go for another walk.